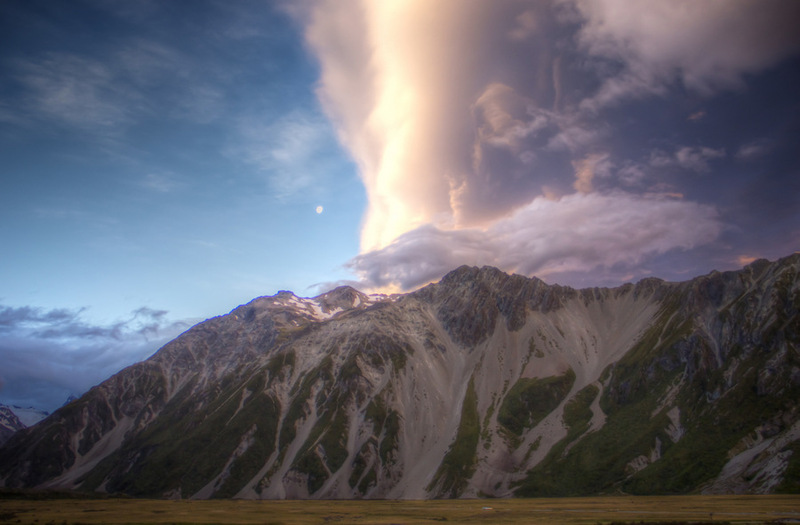 It lasted just a few minutes, but the sunset at Mount Cook National Park was mind-blowing. The shapes of the clouds, the trick of the light shedding pink and orange shades on the rocks and the sky, and the moon shining on the horizon. It was like being looking at a painting, if only for moments. Home to New Zealand highest mountain, Aoraki Mount Cook (3754 metres, 12316ft), the National Park includes all New Zealand peaks over 3,000 meters (9842ft) with the sole exception of Mount Aspiring, further south-west. Despite being one of the major tourist attractions in South Island, I was surprised by how peaceful Aoraki Mount Cook National was. No crowds, only the view on the superb mountain range, dominated by the imposing Mount Cook, first climbed by legendary explorer Sir Edmund Hillary in 1948. Note: Warm thanks to Tourism New Zealand, which kindly provided me with an Explore NZ Card entitling me to a number of free or discounted activities. More thanks to Stray Bus for the awesome comprehensive Stray Everywhere pass to travel across North and South Island on their hop-on-hop-off buses.